I have slowly developed the confidence of baking my own cakes for my near and dear ones birthday. For my elder one's birthday i baked 3 cakes and in September for my niece's first birthday i baked a Barbie doll cake, that definitely was a big milestone for someone who cannot hold a piping bag and do a basic frosting. And to the see the results, the fun and excitement in the lil one's eyes, was an absolute gift and it just took away all the tension i had while making it. When i saw this theme for the BM, i thought of posting those cake recipes. But, i changed my plan and made an entirely different menu for these 3 days. I didn't want all the 3 recipes to be baked, what if somebody with no interest in baking wants to plan a party menu. So, i just thought myself as one such soul and planned 2 other recipes that can be made on stove-top. 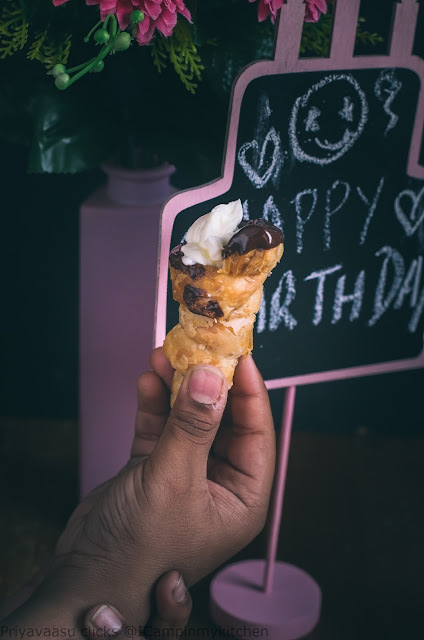 Today's recipe is a simple cream horn, baked puff pastry sheets, filled with sweet cream cheese and chocolate. This recipe is a bookmark from last year's Bake-a-thon, i saw this at Nalini's space and wanted to do it for a longtime now. I have a baked Bread Cone/Cornets recipe filled with chocolate custard, already on the blog. But this is something pretty easy, no kneading, no waiting, just thaw the sheets, wrap and bake. Both my munchkins, were waiting for me click the pictures, the moment i said 'it is done' everything just disappeared!! It is a simple recipe and a super hit among-st kids. Do try and let me know, how you liked it. In a bowl, take cream cheese, sugar and vanilla extract. Mix together well and keep refrigerated until use. I used square puff pastry sheets. Thaw it in the refrigerator for a day and use. Take the puff pastry square on a board, roll it once and cut into 1/2 inch strips, i cut each square into 4 strips. Wrap the strip around the pastry cones, press the edges to seal well. I used 2 strips for a cone. If using pastry sheets, you will be needing only one strip for a cone, since it was a small square, i used 2 strips for one cone. Repeat this for all the cones. I used 4 cones at a time. Once rolled, freeze the cones for 30 minutes. Preheat the oven for 200C and bake for 30-40 minutes or until golden and crispy. Once done, remove the cones from the oven, remove the metal cones and let it cool completely. Melt the chocolate squares in a microwave. Take the chocolate in a Micro-wave Mug, microwave high for a minute. Dip each cone in chocolate, to get its mouth smothered with chocolate. Let it sit for a minute, for the chocolate to dry. Now pipe or spoon the cream cheese filling into each cone and see it disappear. 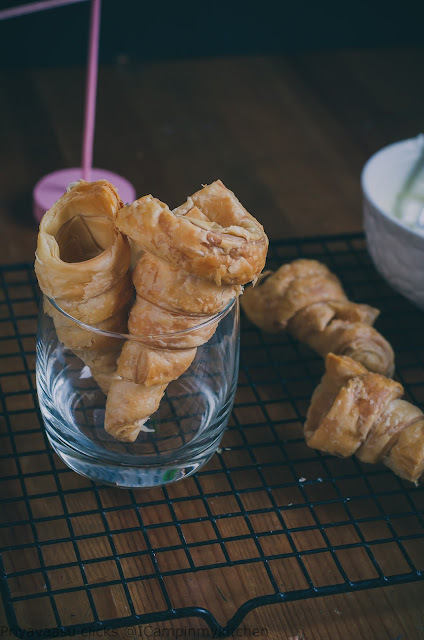 This is definitely a kid's friendly flaky treats, kids will go crazy if they see this cones. 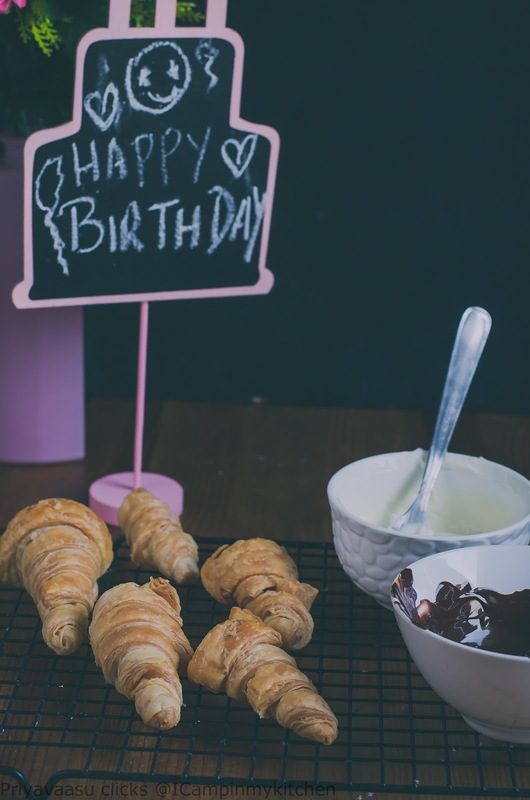 Those treats are delectable and party perfect. I have always loved these rolls as a kid , i must get some pastry sheets to tey these home made rolls . The filling sounds yum and tempting . Wow love the teahnique of making scones. Very nice. Wow! Those are perfect for the kid parties!! The cream cheese cones looks just perfect for the kids. Very nice pictures. 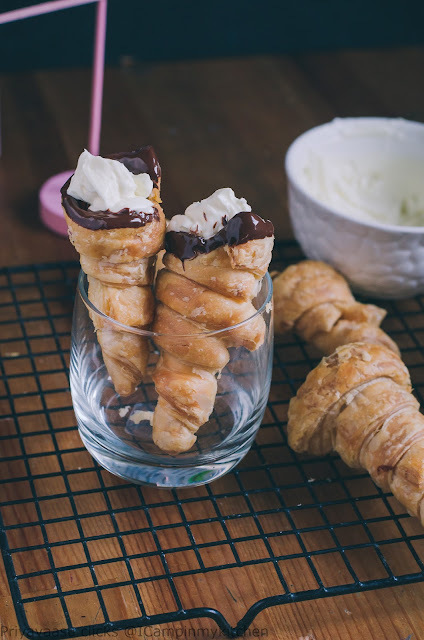 My kids love this cream horns,looks so delicious and tempting.Thanks for the mention. Those puff pastry shells look amazing. There are so many different ways these can be filled. Thanks for the idea. Priya my boys will go crazy if I show them these pictures..utterly sinful and must have been so delicious!